Three lively distinctive pieces – two on the bill and an additional surprise – form Scottish Ballet’s autumn season, all in their own way combining pure motion with atmosphere and panache. The surprise is Sophie Laplane’s Maze, a piece set in three small acts: a male duet of mirroring, combat and clockwork momentum; a female duet with a birdlike pulse; and a quartet of knotted lifts and partner swaps. In this maze the relationships change and develop, but there’s also a geometrical feel of patterns, loops and repetitions, carried along at whipcrack pace with invigorating style. New York-based Bryan Arias’s Motion of Displacement has similar abstract intrigue. The opening freeze is gorgeous; a rope chain of dancers barely lit by flame-red floating bulbs. The chain fractures, and a tangle of liquid movement passes along the smaller line in perfect flow. Solos break free, taut with long leg swipes and high straight kicks, melding into duets and ensemble pieces. There are moments when a human connection leaps out – a line of men running forward with bravado, then shyly covering their eyes; dancers sliding in their stockings; a motif of examining something in the palm of the hand – but there is something disconnected about the piece as a whole. The pace and energy of the choreography picks up in a smaller second act, scored by Bach’s Komm, Jesu, Komm, but it’s hard to find where we are coming from or going to. Javier de Frutos’s Elsa Canasta forms the second half of the evening. 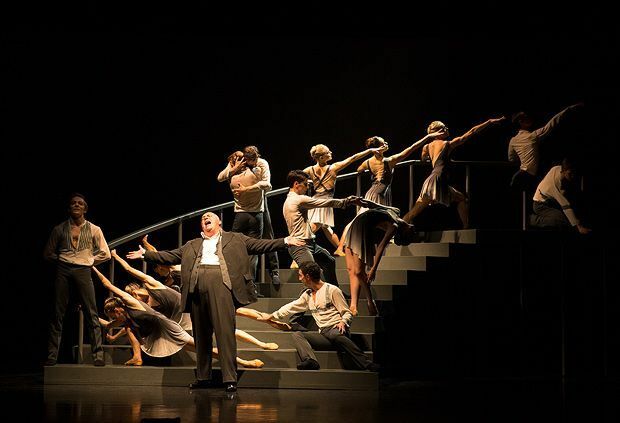 First performed in 2003, it’s based on a 17-minute ballet score by Cole Porter, merged with some of his songs. De Frutos recently revised the work for Scottish Ballet, with more gender balancing, and a new singer – the majestic, fabulous Nick Holder. Designer Jean-Marc Puissant’s bold sweep of staircase curves centre stage and provides a framework for the choreography, with dancers looping around it, leaping from it and throwing themselves with abandon against the bannisters. Bruno Poet’s washes of coloured light give the whole thing the sultry glamour and late night melancholy of a Hopper painting. At the heart of this setting is Holder, owning Cole Porter’s songs with sorrow, sass and triumph, an anchor for the dance, never invasive. The duets seem as if they are thoughts running away from him, and he forms the static eye of kaleidoscopic ensemble sections. But this is a piece above all drenched in atmosphere, and it’s in the little details this is borne out – glimpses of chorus girls, a line of men awestruck by a woman walking upstairs, the stretched yearning of lovers Victor Zarallo and Thomas Edwards in an embrace. This last is a reminder that movement is at its most powerful when it’s driven straight from the heart. Scottish Ballet Autumn Season 2015, Theatre Royal, 0844 871 7627, until 26 Sep, 7.30pm, £14--£24 (£13--£23), then touring. Triple-bill featuring Javier de Frutos’ Elsa Canasta set to Cole Porter, the world premiere of Bryan Arias’ Motion of Displacement, set to music by Bach and John Adams and Maze, a new piece of work created by contemporary dancer Sophie Laplane.